Finding a great deal on a Copper Cork Screw Half Cheek Driving Bit can be difficult. But do not worry as we have a vast selection of Half Cheek Driving Bits that are not just made of superb quality but also affordable. 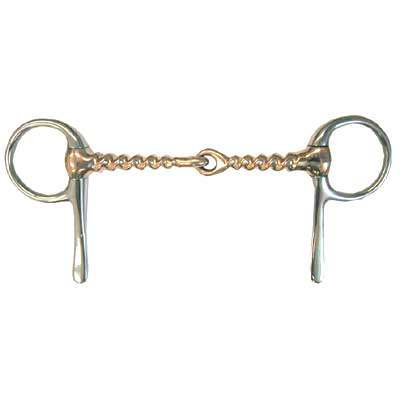 This item measures 1 3/4'' rings, 13mm mouth and 2 3/4'' shanks. This Half Cheek Bit also creates great pressure on the mouth with the corkscrew design. The bit also uses copper which causes the horses mouth to salivate. The cheeks in this item are also solid stainless steel which will last a lifetime. So get yourself a nice set of Horse Driving Bits today. When buying from us you can rest assured you will be purchasing a great product.